Siri works from the Locked Screen in iOS, letting you get things like the weather, make quick phone calls, and a variety of other incredibly useful tasks, but for the privacy and security buffs out there, this may be considered undesirable. If you don’t want Siri to be usable when the iPhone or iPad is locked with a passcode, you can disable Siri lock screen access easily, here’s how to do that. This leaves Siri on overall but prevents access from the locked screen of an iPhone, iPad, or iPod touch, offering a sort of security measure to unintended usage of Siri. 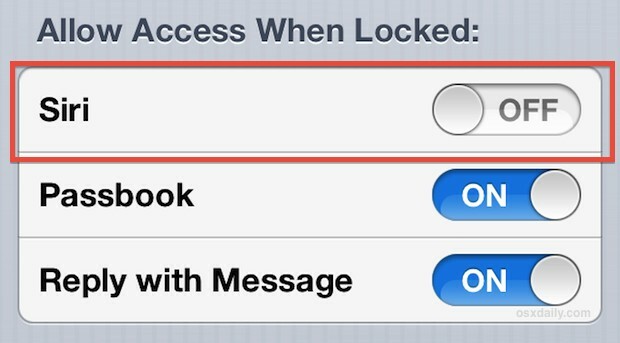 The settings change is immediate, you can lock your device and test it if you’d like. Now anytime the screen has been locked, Siri won’t be usable from the lock screen, and holding down the Home button will no longer do anything when the device is passcode protected. Of course, Siri will remain accessible once the device is unlocked and either at the home screen or within apps. For most users, the usefulness of Siri’s quick access whether the devices is locked or not will outweigh the security benefit of preventing access from a locked device. This is particularly true for those of us who always have our iPhones with us anyway, and keep in mind that for Siri to perform most tasks, a password will need to be entered anyway. You could also go all out and disable Siri completely but that is really not recommended, it’s a great feature that has so much usage potential and helpful commands. The only risk I see with leaving Lock Siri on is if you lost your iPhone and someone was able to use Siri to make phone calls and try to guess people in the address book. You can’t do much else if you have a password set, but you can make phone calls to new numbers by just phonetically saying the number like “Call 1-111-1111-1111”, which could potentially rack up a long distance bill but not much else. Good tip, I would appreciate some more security tips for the iPhone if you have any. Thank you for the web site it is wonderful. It’s fun without the lock! I like to get my friends phone when he’s not looking and tell Siri, “From now on, call me a$$hole.” The look on his face from subsequent Siri inquiries is priceless! Another trick is to tell Siri to text a name in your address book. You can send a nasty message to your victims friend via their locked phone.